Students, teachers, professors, and pastors alike will find in Leonard's resource an exceptional history that provides a foundation for this enduring faith. Bill J. Leonard holds the James and Marilyn Dunn Chair of Baptist Studies at the Wake Forest University School of Divinity where he was the founding dean. In 2010 he retired as dean but continued to teach church history in the divinity school and the religion department of the university. Prior to joining the faculty of Wake Forest in 1996, Leonard served as Professor of Church History at the Southern Baptist Theological Seminary, Louisville, Kentucky, 1975-1992. While there he was for a time Associate Dean, president of the Faculty Association, editor of the Review and Expositor, and W. W. Brooks Professor of American Religion. From 1992 to 1996 he was Chair of the Department of Religion and Philosophy at Samford University, Birmingham, Alabama. Leonard is the author or editor of some 15 books including The Nature of the Church; Word of God Across the Ages: Using Church History in Preaching; God's Last and Only Hope: The Fragmentation of the Southern Baptist Convention; Appalachian Christianity: Profiles in Regional Pluralism; Baptist Ways: A History; and Baptists in America. 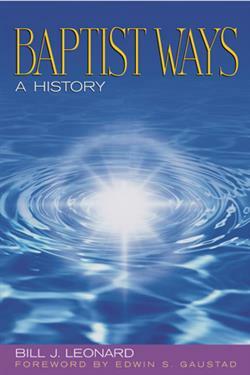 His most recent books are Baptist Questions, Baptist Answers, and The Baptist Bible (co-editor), both published in 2009. Leonard is also the author of over 400 articles published in a variety of journals, periodicals and books. Dr. Leonard holds a BA from Texas Wesleyan College (1968), an MDiv from Southwestern Baptist Theological Seminary (1971), and a PhD from Boston University (1975). His spouse, Dr. Candyce Crew Leonard, is professor of Humanities at Wake Forest University with specialization in Spanish literature. They have one daughter, Stephanie. The Leonard's are members of First Baptist Church, Highland Avenue, the oldest African American Baptist congregation in Winston-Salem, North Carolina.